There’s not many days lately where you can’t find the Backstreet Boys somewhere, whether it be on TV, onstage or even on the radio. With their latest single “Don’t Go Breaking My Heart” steadily climbing the Billboard Hot 100 chart and currently at 17 on MediaBase’s top 40 radio airplay chart, the group is definitely entering a new era and everyone wants in on it. In the past month, millions have tuned in to catch Kevin, Brian, AJ, Nick and Howie on The Tonight Show With Jimmy Fallon, TRL, and Good Morning America. This week, however, James Corden came to them for his segment “Take a Break” in which he famously goes and tries out other people’s jobs. 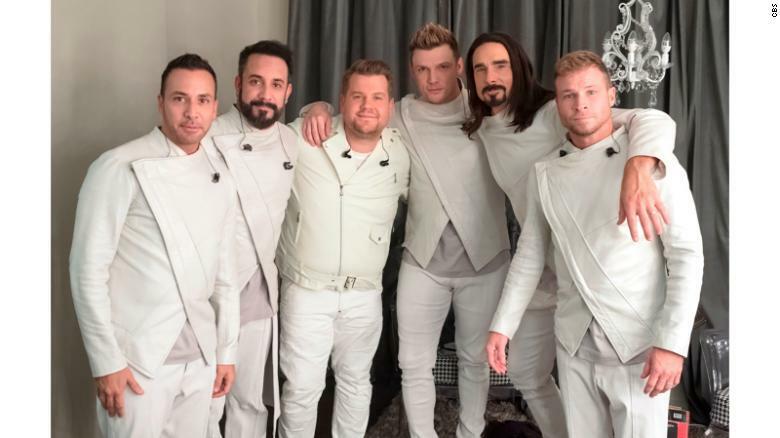 Anyone who watches The Late, Late Show regularly knows that Corden is a huge boyband fan and loves to join in any chance he gets (already having joined the Backstreet Boys on his own set early last year). With the Boys in Vegas, it was the perfect opportunity to make his ultimate dreams of becoming a Backstreet Boy come true, even if it did mean kicking Brian Littrell out. If you missed the hilarious late night moment and want to see how it all played out (including James’ stellar dance moves), watch below! You never know who is going to show up in Las Vegas, but you have to be there to find out. The Boys kicked off their 2018 run last night and will perform their final Vegas shows in April 2019. Don’t miss it!